If you're new to the indie game Botanicula, then this free Windows 7 themepack will serve as a visually splendid introduction to it. And if you've already played it…well, is that any reason to deprive yourself of the delightful visuals and quirky sounds that are such a big part of the game's charm? PCWorld has put together the Botanicula Windows 7 Theme to bring the distinctive feel of Botanicula to your desktop. In a subaquatic realm, the friends come across a giant crab. Botanicula comes to you from Amanita Design, the same folks who created Machinarium--although there's little family resemblance. This game is set in a colorful world of nature rather than a brown and beige steampunk universe. The story involves a team of five insectoid friends who travel through the branches of a tree--their homeland--to save it from energy-sucking parasitic enemies. 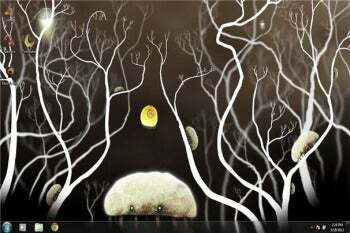 The wallpapers in this themepack give you a good feel for the game's eclectic spaces and inhabitants, from the ethereally beautiful domains of the enemy, to escapades on the moon and on glowing pastel branches, to encounters with giant tortoises and crabs, and worms hidden in vibrant green sprouts. Fans will also appreciate the funny, original sound-scheme, which is a mélange of real voices saying "aaah," "hmmm," "heeheee," "hurrah"” and "mweemwawawawa" (whatever that one translates to).